Power carving is a fast growing area within the carving fraternity. Some may eschew the process as noisy and inconvenient, but being able to remove wood quickly when needed is very useful. Many carvers are now proud owners of products such as the Arbortech and Guinvere carving wheels, and also smaller handpieces for use on Dremel and Foredom rotary carving units where the handpieces accept carving blades. These tools are quite refined, but what happens when we want more oomph behind our tools? One such item is the PSE 180E power carver/scraper, ideal for when you require things to go a little quicker but still in a controlled manner. 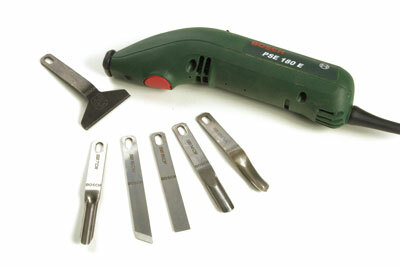 Quite simply, it is a handheld percussion carving unit that accepts attachments into the end of the body of the tool. Supplied with the tool are six carving chisels: two bent chisels (a gouge and a V-tool), and four straight tools (a V-tool, a gouge, a skew chisel and a straight chisel). There is also a scraper attachment that is great around the home for removing things like paint and tiles, but sadly not much use for carving. The tool is quite large but not excessively heavy, and the vibration from the percussion in use is only slightly more than that from the smaller handpiece units already mentioned. I worked on some ash, elm, oak, sycamore, lime and some exotics and despite the various densities and fractiousness of the timber, the tools performed flawlessly. The cuts were clean ï¿½ though this depends on how sharp the blades are, of course ï¿½ and it was possible to have large cuts without much force on the part of the carver, so it does afford a lot of control over what youï¿½re doing. That said, the blades supplied are quite chunky and are best suited for big cuts, bulk wood removal, and shaping. 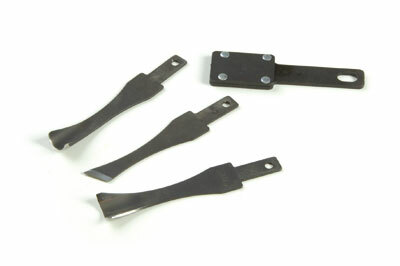 If you require different blade types consider the Flexcut SK fitting blades. These do not fit directly, but with the aid of the SK105 adapter (available separately from Axminster Power Tool Centre) one can slot the Flexcut blades into the PSE 180E. This gives more options and greater versatility, making the tool more user friendly for the carver. The carver and blades are supplied in a nice wooden box, and there is a standard instruction manual, as well as a good basic carving booklet on how to use the power carver. I must admit to being very surprised at what I think is the low selling price of this item. I think it represents great value for money, and if you are looking to start power carving larger work, it's ideal. "I think it represents great value for money, and if you are looking to start power carving larger work, it is ideal"